If you notice that your stomach acting up regularly, it could be time to formulate an elimination diet plan. Intolerances to dairy, gluten and nuts are increasingly common, and elimination diets are the best way to identify and which items are affecting you. So, how does an elimination diet work? It’s fairly self-explanatory: it involves removing foods from your diet, one by one, to see which ones are causing the negative reactions you may be experiencing—such as a sore stomach, bloating, gas, or diarrhea—and then reintroducing them one at a time to see if the symptoms recur. Eliminate these potential trigger foods for about three weeks and then begin reintegrating them. An elimination diet meal plan helps you clearly understand which foods are working for you and which ones aren’t. For example, you might think you’ve got a gluten intolerance, so you stay away from all items that contain gluten, when it reality it might be another ingredient, like milk, that’s causing the issue. This is quite common and elimination diets can point you to the exact problem, so the list of foods you can eat will again outnumber those you can’t. Although everybody is different, there are some foods that are more likely to cause intolerances than others. Let’s take a look at a typical elimination diet food plan. Nuts (again, this depends on the individual). The best elimination diets include certain foods to eat and certain foods to avoid. Generally speaking, the more restrictive the better. Yes, it’s more work, but as with most things, the more work, the greater the payoff. Avoiding wheat, processed foods, and certain nuts and legumes are important here. However lists do vary on what you should avoid. For example, some elimination diets want to hold off on all grain products, including rye, while others allow them. The choice is yours. Some of the items on this list are not “unhealthy,” however they create problems for some people. When you’re on elimination diet, you’ll want to eat foods that typically don’t cause inflammation. This includes most fresh fruits and vegetables, seasonings, water, fats in the form of oils such as olive oil and flaxseed oil, and whole grains such as brown rice and buckwheat. You can also eat unprocessed meats such as turkey and other game meats. Here are some items available on an elimination diet plan menu. During your elimination diet, you should be focused on getting the majority of your hydration through water. Water is free of additives and part of a healthy diet, and there is virtually nothing in it that will impact you negatively. If you don’t trust tap water, you can purchase bottled water. Unfortunately, since citrus should be eliminated on the diet, avoid flavoring it with lemons or limes. You can also drink nut milks and non-animal product milks. Test the waters with coffee and tea, and avoid adding any sugar, milk or artificial sweeteners or creamers. It’s also imperative to stay away from soda, alcohol, and other bottled products. As you can see, there are a number of ways you can take the challenge out of an elimination diet, because there are still many food options available. Here’s a look at what you can eat at any time of the day. Breakfast: Oatmeal with berries and sliced almonds. Add almond milk if you like. Lunch: A big salad with avocado, flaxseed and olive oil, and balsamic vinegar dressing. Include any veggies you like, and you can even put on some fresh turkey, salmon, or tuna. Dinner: Lamb, quinoa, or even a bison stew full of fresh veggies (just avoid tomatoes). You can also make a bean salad served alongside more vegetables or some game meat or fish of your choice. Roasted sweet potatoes are also a great option at dinner time. Dessert: You could make a fresh fruit gelato with almond milk in your blender, or make an oat/almond-butter ball as well. The key to remember with the elimination diet is that foods cycle back in and out of it over the duration, so your menu will adapt according to your personal reactions and needs as items are reintroduced. As you move through the elimination diet, different foods will become available that you can use to create great meals. This is one of the fun challenges about the elimination diet plan. It’s recommended that you start by eliminating one or two groups—say dairy and gluten—while still including nuts and beans. Use these items in your recipes and meal ideas for seven to 10 days and pay attention to any symptoms—fatigue, pain, bloating, etc. If nothing happens, reintroduce gluten products and other grains to see if the problem comes back. This will allow you to create a menu with certain grains (I’d start with whole grains) to see how you react. As different foods become integrated and eliminated, you can come up with elimination diet recipes to accommodate what’s currently part of your diet plan. It’s very important that you observe what you can and can’t eat; otherwise you will not be successful. If you’re combining ingredients that you’re supposed to be controlling, it will be impossible to determine what the problem is and what you should avoid to stay healthy. Create shopping lists in advance so that you know what to purchase and use in recipes. Eating out is a part of life and it’s almost unavoidable. It’s not particularly easy to do when following an elimination diet, but here are some pointers. Be selective of where you eat. Fast-food restaurants are virtually impossible to order from, so avoid them entirely. Stick to restaurants that only offer fresh food. Read the menu carefully. You don’t want to ingest something you’re trying to control. Ask if you’re unsure. Note: don’t explain your life story to the server or ask redundant information that’s clearly outlined on the menu. Stick to salads and ask for your dressing on the side. If you’re ordering any cooked dish, instruct the server to ask that it not be cooked in butter or drizzled with any sauces. Always choose seasonings over sauces. When you’re on your elimination diet, there are a few things you’ll want to pay close attention to. Energy levels: After taking away certain items, are you feeling more energized? Make a note of any changes you notice once certain foods are reintroduced. Keep in mind the first two to three days are the hardest. Calories: Make sure your calories aren’t drastically reduced. Vegetables: Get at least three servings a day. Hydration: Drink eight glasses of water a day. Read the labels: Corn starch and other starchy ingredients are in a lot of processed foods—that’s why fresh foods are encouraged. 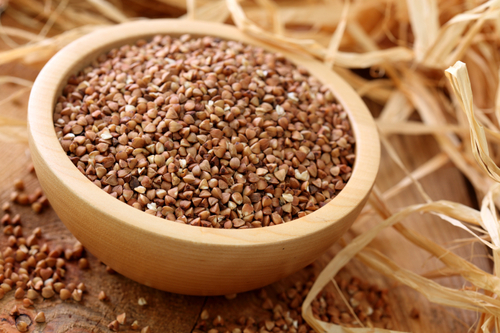 Grains: Gluten-free breads still contain grains. “Food Sensitivity Elimination Diet,” Whole Health Chicago web site, April 1, 2010; http://wholehealthchicago.com/2010/04/01/allergy-elimination-diet/, last accessed March 18, 2016. Berzin, R., “The simple elimination diet that could change your life forever,” Mind Body Green web site, February 6, 2014; http://www.mindbodygreen.com/0-12540/the-simple-elimination-diet-that-could-change-your-life-forever.html, last accessed March 18, 2016. Walsh, B., “Food sensitivities and intolerances,” Precision Nutrition web site, http://www.precisionnutrition.com/elimination-diet, last accessed March 18, 2016. Shah, A., “The Easy Way to Figure out if You Have a Food Intolerance,” Greatist web site, June 9, 2015; http://greatist.com/grow/easy-elimination-diet-for-food-intolerance, last accessed March 18, 2016. Lipski, L., “Comprehensive Elimination Diet,” Oxford University Press web site; http://global.oup.com/us/companion.websites/9780195371109/pdf/00_Mullin_Appendix_3.pdf, last accessed March 18, 2016. “Elimination Diet,” The Dr. Oz Show web site, November 12, 2013; http://www.doctoroz.com/article/elimination-diet-printable-one-sheet, last accessed March 18, 2016.